Tired of buying factory aluminum or steel belt tensioners that bend, break or get weak over time causing belt slip and belt alignment issues? Have you been hearing belt squeaking noises, power steering feel weak or your AC not as cold even after changing the belt? Chances are your tensioner is going bad or is already bad, don't get left stranded. If the tensioner is weak it will allow the belt to slip slightly causing the belt to glaze over. A glazed belt would be the cause of your squeaking problems, slipping and even throwing the belt off. Replacing the tensioner is the most effective way to cure this problem. Make the switch to a UPR Billet 3 Bolt Belt Tensioner for your 2003-2004 Ford Mustang Cobra. 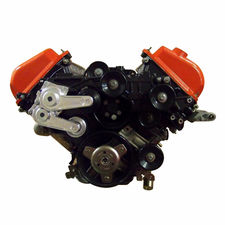 This package was put together specifically for the Supercharged 2003 and 2004 Cobra that uses one tensioner for the primary drive belt with a smooth tensioner pulley and another tensioner on the supercharger secondary belt. The factory ribbed pulley for the supercharger belt is required and bolts on to our tensioner. This all new belt tensioner is 50% thicker than the factory pieces and made from 6061 Billet Aluminum that will prevent any kind of bending or breaking. Can be used with stock tensioner pulley or our Billet 76mm pulley. Greatly reduces belt slip especially on manual transmission vehicles that shock the belt system more than automatics. Custom made spring for better belt tension and built with custom needle bearings and SS races for smooth tensioner movement throughout it's operating range. This is all backed by our lifetime guarantee! *Supercharger tensioner requires the stock ribbed pulley, accessory tensioner pulley must have smooth side of billet pulley facing towards engine. No one else can stack up to the bold clean styling of our aftermarket Billet dress ups, Street Strip & Racing Suspension & Performance Parts for your late model American Muscle Car! Make the switch to a UPR Billet 3 Bolt Belt Tensioner for your 2003-2004 Ford Mustang Cobra. This package was put together specifically for the Supercharged 2003 and 2004 Cobra that uses one tensioner for the primary drive belt with a smooth tensioner pulley and another tensioner on the supercharger secondary belt. The factory ribbed pulley for the supercharger belt is required and bolts on to our tensioner. This all new belt tensioner is 50% thicker than the factory pieces and made from 6061 Billet Aluminum that will prevent any kind of bending or breaking. Can be used with stock tensioner pulley or our Billet 76mm pulley. Greatly reduces belt slip especially on manual transmission vehicles that shock the belt system more than automatics. Installs in 60 minutes or less with normal hand tools using factory hardware. *Supercharger tensioner requires the stock ribbed pulley, accessory tensioner pulley must have smooth side of billet pulley facing towards engine.